There are no specific records relating William Shakespeare's attendance at school but the following details can be assumed as being a reasonable accurate reflection of his childhood, school days and education. William Shakespeare's parents were both illiterate but because of John Shakespeare's standing in the community, and the fact that with his election to the position of Alderman came the free education of his children, it is safe to assume that he took full advantage of this fringe benefit! So William Shakespeare was no doubt given a free education. Nothing is known nowadays about how long William Shakespeare attended school or how long his education lasted but Nicholas Rowe (first editor of Shakespeare's Works, after the Folio editions, and his first biographer in 1709) reported that "...the want of his assistance at Home, forc'd his Father to withdraw him from thence" . Rowe's source was the actor Thomas Betterton (1634-1710), who made "a journey to Warwickshire on purpose to gather up what remains he could, of a name for which he had so great a veneration." We therefore make the assumption that William Shakespeare at least attended King Edward VI Grammar School and received an education in Stratford from the age of 7 in 1571 and left school and formal education when he was fourteen in 1578. The school is also referred to as the King's New School and was named according to a charter by King Edward VI (Queen Elizabeth's younger brother) in 1553. It is important to note that a school's curriculum and the Elizabethan education of children was dictated by the ruling monarch of the time which would, of course, also reflect the religion of that particular King or Queen. This must have caused considerable consternation due to the fanaticism of the followers of the Catholic and Protestant religions. During the Tudor period Henry VIII adhered to the Catholic religion and then due to his liaison with Anne Boleyn moved to the Protestant religion. Henry was succeeded by his son King Edward VI who adhered to the Protestant religion. Edward died at the age of 15 and was succeeded, for a brief nine days, by the tragic, Protestant, Lady Jane Grey, who was beheaded. Edward's eldest sister Mary then succeeded to the throne. Queen Mary was a staunch Catholic and was determined to return the country to the ' old religion '. Her violent methods to gain converts to the Catholic religion led to her nickname of ' Bloody Mary '. 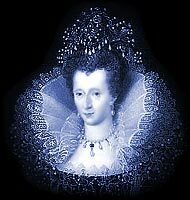 Mary was succeeded by her sister Queen Elizabeth who was a liberal follower of the Protestant religion. It must have been extremely difficult to keep changing Elizabethan Education with the religion of the times and equally dangerous not to! The activities of William Shakespeare's childhood and his education was dictated by the ruling monarch and the prevailing religion. In the Elizabethan era the childhood for boys, from the age of five to seven, was spent by being sent for the most elementary level of education at what was called a ' Petty School ' although lessons and general education were conducted not in a school but in the house of the ' teacher '. The word ' petty ' probably derives from the French word ' petit ' meaning little or small. These Petty schools were usually run, for a small fee, by a local, well educated housewife, the were also referred to as ' Dame Schools '. At the ' Petty School ' or ' Dame School ' children's education would consist of being taught to read and write English, learn the catechism and also learn lessons in behaviour. These were considered the most important elements of Elizabethan Petty School education and what must be taught during childhood. The catechism was an Elizabethan book detailing the details of the Christian Faith. Children would be expected to learn by heart certain passages at the Elizabethan Petty School which related to being a 'good Christian' as part of their education. An example of this would be "I will renounce the devil". The standard behaviour during childhood and expected of properly brought up children in the era was published in Hugh Rhodes's Book of Nurture (1577) and adhered to at the Petty School. The basic principles of childhood and education would include respecting their mother and father, asking their parents blessing, rising early in the morning and saying their prayers. Basic manners were also taught during childhood and Elizabethan education at the Petty School including the correct behaviour at the table such as eating small morsels, chewing properly , using a knife and using a napkin. Children would also be taught their 'place' in society which included where they should sit at the table. Reading and Writing skills were learnt during Elizabethan childhood and education from the alphabet detailed on a horn-book. A horn-book was a piece of parchment usually pasted on to a small wooden board with a handle, and covered with a thin plate of transparent horn ( from where the name of horn-book was derived ). This made the horn-book durable and inexpensive and an important item during the childhood and Elizabethan education of children. The horn-book displayed the alphabet in both small letters and capital letters. The Lord's Prayer in English was also included on the horn-book together with the mark of the cross, hence the alphabet detailed on the horn-book was known as ' Christcross-row ' or ' chrisscross ' - religion was clearly an important element in the Elizabethan childhood and education of children and the horn-book a necessary tool for every Elizabethan school boy. The Tudor / Elizabethan alphabet contained 24 letters, as opposed to the present day alphabet of 26 letters. In the Tudor / Elizabethan alphabet the letters "u" and "v" were the same letter as were and "i" and "j". The "j" was usually used as the capital form of the "i"in the alphabet. The "u" was used only in the middle of a word, and the "v" was used at the beginning. The other difference with the Tudor / Elizabethan alphabet was that there was another letter which resembled a "y" which was used to represent the "th" sound. So the word "the" was written in a similar way as "ye" would in the present day. Some words were also spelt with and additional "e" at the end. And finally, numbers were frequently given in lower case Roman numerals, with the last "i" in a number written as a "j". For example, viij March. This vital, but little known, piece of information about the alphabet is essential when looking at copies of original manuscripts of the period - examples can be found in the ' First Folio '. Learning the alphabet used during the Elizabethan era will no doubt clarify many questions that the differences of the Tudor / Elizabethan alphabet have raised with the existing alphabet. Children of Noble birth were invariably taught by tutors at home but, from the age of 7 to 14, children of a lower standing went to Grammar Schools - the most common institute for Elizabethan childhood and education during the Elizabethan period. The Grammar School in Stratford was called King Edward VI Grammar School and William Shakespeare would have started attendance at the Elizabethan Grammar school at the age of seven - his education truly beginning. The school and education would have been financed by the local Guild. The younger boys, including William Shakespeare, would have spent their early childhood being taught by Ushers, a junior master or senior pupil at the Grammar School. The boys, including William Shakespeare, first learnt the rudiments of Latin with the assistance of the Tudor text-book known as Lily's Latin Grammar - using the horn-book and the alphabet as a tool and the basis of Elizabethan education. This short introduction to grammar and education, compiled by William Lily, had been authorised by Henry VIII as the sole Latin grammar textbook to be used in education and schools. In 1558 a child's speller was written in England as spelling consistency gradually emerges. The first year of Elizabethan education the curriculum would have consisted of learning parts of speech together with verbs and nouns. The second year of education the rules of construction and forming sentences and the third year of Elizabethan education would have concentrated on English-Latin and Latin-English translations. The Ushers often refused to be bothered with the teaching of handwriting and this element of Elizabethan education was often taught by a temporary travelling scrivener for a few weeks during the school year. From the age of 10 the boys, including William Shakespeare, would leave the Ushers to study with the Masters at the King Edward VI Grammar School thus continuing with their translations and extending their Elizabethan education by studying the works of the great classical authors and dramatists, such as Ovid, Plautus, Horace, Virgil, Cicero and Seneca. The histories of Caesar, Sallust and Livy were studied too, for their moral example was believed relevant to life in Elizabethan England and therefore included in their education. This was the basis of the Elizabethan childhood and education of Elizabethan children including William Shakespeare. The King Edward VI Stratford Grammar school, attended by William Shakespeare, may also have included the study of Greek, but textbooks were scarce (due to printers having insufficient Greek type) and only the very best teachers had sufficient experience to teach the language. It is therefore unclear whether William Shakespeare studied Greek during his childhood and education. The salaries, or endowments, offered by the King Edward VI Stratford grammar school were �10 per year for a Master and �40 per year for the Headmaster and these were on par with the most prominent schools in England. The King Edward VI Stratford grammar school, therefore attracted excellent teachers and two of them rose to great intellectual heights by founding colleges. Richard Fox, who was appointed master at King Edward VI Grammar school in 1497, he later became principal minister under Edward VII as Bishop of Winchester and founded Corpus Christi College, Oxford. Another master, William Smyth, founded Brasenose College. It is also probable that two Oxford graduates, Ben Hunt and Thomas Jenkins, were employed as Masters of Elizabethan Education at the time William Shakespeare attended the King Edward VI Stratford Grammar school. These references made it clear that the childhood of William Shakespeare and the Elizabethan education that he received at The King Edward VI Stratford Grammar school was of a high quality. Elizabethan Life at school and childhood in general was quite strict for the boys, and this was have included William Shakespeare. During summer school for William Shakespeare started at six o'clock in the morning and finished at five o'clock in the evening. There was a two hour break at midday. Because of the dark nights the hours changed during the winter start at seven and finished earlier at four o'clock. Elizabethan education and School for William Shakespeare consisted of a five full days and a half-day on Thursday for 40 to 44 weeks of the year. This meant that the boys, including William Shakespeare, spent at least 2,000 hours in school � more than double the current school hours. Elizabethan education, including that of William Shakespeare, was based on repetition and constant examinations. A typical school week at King Edward VI Grammar School for William Shakespeare would cover an examination on the previous Sunday�s sermon on Monday, the basic curriculum from Tuesday to Thursday, examinations on Friday and Saturday demanded study of the catechism and some arithmetic. The boys, including William Shakespeare, were expected to converse in Latin at all times in order to improve their spoken fluency in the language and any boy caught speaking English at school was punished. The punishments were carried out on Fridays so this, along with the examinations, must have been the worst day of the week for the schoolboys. Punishments were fierce and fifty strokes of the cane was not an uncommon occurrence. Childhood and Elizabethan education for William Shakespeare at King Edward VI Grammar School was clearly tough. End of Term brought some change to the normal routine when the senior boys were encouraged to perform some classical drama. This is therefore where William Shakespeare probably obtained his taste for acting, along with the many touring troupes of actors who visited Stratford! The first plays performed in by William Shakespeare the actor must have included the Greek and Latin classics! Boys normally attended Grammar school until they reached the age of fourteen when they would have continued their Elizabethan education at a University. Oxford University or Cambridge University were of course the most popular choices. William Shakespeare, however, was withdrawn from school and education at the age of fourteen in 1578 due to the financial problems being experienced by his father. His father was in debt, his religious beliefs (Catholic) were in question and he had fallen from being a pillar of the community to a fallen man. It is quite possible that the privilege of granting free Elizabethan education for his children was removed by the Board of Alderman at this time. At this point the childhood and education of William Shakespeare came to an abrupt end. William Shakespeare, the great literary genius did not receive an Elizabethan university education. A Classical Elizabethan education would have been provided at universities during the Elizabethan era. Teachings from various faculties were available to University students. The University Faculty of the Arts - The Arts would have included Philosophy, Rhetoric, Poetics, Natural History education etc. Elements of the above Classical University Elizabethan education would have taken by the prominent figures in the Elizabethan era but this typical University education would have been missed by William Shakespeare. In addition to a University Elizabethan Education the privileged classes would have also toured the major cities of Europe. During the Elizabethan era even domestic travel was exceedingly difficult. Actual laws existed against those who had no good reason to travel. This was because each village had a responsibility to look after its own poor, and were exceedingly unhappy to pick up any vagrants from the road. So in order to travel you need both money and a license. Travelling to other countries meant getting permission from the monarch to do so! Therefore it was usually only the nobility were able to travel abroad. The lower classes only did so when undertaking a military career or the life of a sailor. It was easy to continue formal Elizabethan education through travel during the Elizabethan era.